I validated a state testing roster today, which means that the results should be available within the next few weeks. Regardless of what the test results indicate (because the test was not aligned to Common Core anyway), I was reminded today that my students have taken in the lessons that can't be tested via a multiple choice assessment: kindness and empathy. One of my goals every year is to create a family-like classroom environment. I stress kindness to others and forbid students from making one another feel threatened or uncomfortable. 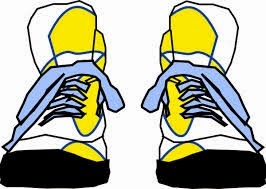 Today, a few students approached me and indicated that they noticed that one of their classmates (in their other content classes) is in need of a new pair of shoes. The student is in the country on refugee status and has been wearing the same pair of worn-out shoes for several years. They are planning to take up a collection and surprise him with a new pair of shoes (they discreetly checked the size during PE class) after the long weekend. I was so touched to hear of this plan that I opened my wallet and made the first donation. Like most teachers, I am curious about the standardized test results. However, I will not get too emotional over them because as far as I'm concerned, these students are advanced in my book.